Size of this PNG preview of this SVG file: ८०० × ४०० पिक्सेल. इतर resolutions: ३२० × १६० पिक्सेल | ६४० × ३२० पिक्सेल | १,०२४ × ५१२ पिक्सेल | १,२८० × ६४० पिक्सेल | ९०० × ४५० पिक्सेल. 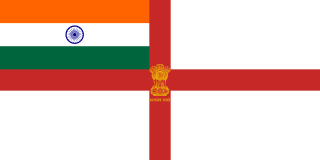 English: Naval Ensign of India. This most recent version of the ensign was adopted in 2014 after minor changes were made adding the inscription "Satyameva Jayate". This vector image includes elements that have been taken or adapted from this: Emblem of India.svg. लेखक Original upload by Denelson83, most recent version by Fry1989. This file is in the public domain, because Jean-Pierre Demailly has previously specified that his images are in the public domain. १४:२५, ५ सप्टेंबर २०१४ ८०० × ४०० (२१७ कि.बा.) B4567V Reverted to version as of 00:30, 7 January 2013, emblem without motto. २३:४२, १५ ऑगस्ट २०१४ ८०० × ४०० (१८२ कि.बा.) Fry1989 Ensign has changed again.